We may be facing a shortage of helium in the not too distant future. This may seem like a trivial problem. We can live without balloons, right? Actually, helium is used for a number of industrial processes and a shortage, with a corresponding increase in prices could be serious. As you might expect, government has helped to create the problem. Here is the story in the Washington Post. Earlier this spring, there was a rare bipartisan flurry of activity around something almost every legislator could agree on: Avoiding a sudden lapse in the national supply of helium. After years of warnings about rising worldwide demand, Congress remembered that a 1996 law demanded the shutdown of the Federal Helium Reserve–a vast underground lake of gas that stretches from Texas to Kansas–just as soon as it paid off the cost of its creation. That will happen at the end of this fiscal year, October 1. If nothing changes, the rest of the 10 billion cubic feet would have to stay underground, cutting off 40 percent of U.S. consumption, while the cost goes through the roof. In April, the House made short work of a bill that would keep the program operating. The Senate Committee on Energy and Natural Resources followed suit in June. And then: Nothing. Congress leaves for recess today, and no vote is scheduled; the Senate leadership office didn’t return calls for confirmation on whether the bill would be brought to the floor. And that’s making the folks who run the helium reserve very nervous. Yeah, no kidding. Helium isn’t just a party gas–it’s also used in a wide range of advanced manufacturing processes, like making computer chips and optical fibers, as well as research and medical procedures, like cooling magnets for MRIs and visualizing lung tissue. That’s why corporations like Intel lined up to push for the helium reserve’s continued operation, along with private refiners that use pieces of the federal infrastructure. Then there are all the government users–scores of universities and military agencies that get a special rate on helium for things like rocket systems and chemical warfare testing. Most of us owe some piece of our daily lives to helium, without even realizing it. That wasn’t the case in the mid-1990s, when Congress passed the Helium Privatization Act, giving the Bureau of Land Management a date certain for when it would have to get out of the business. Technically, that isn’t until 2015, but the reserve ended up selling off enough helium to pay back the $1.3 billion loan at a faster-than-anticipated clip. The Senate bill does solve the problem at least in the short term, allowing the Amarillo office to live off its own revenue selling helium until it gets down to 3 billion cubic feet, which will be retained for federal use. After that, Amarillo will be reduced to a skeleton staff (an earlier reduction in force got rid of most of the younger employees, so most are nearing retirement anyway). And then, the feds will manage helium extraction on government-owned land just like any other natural resource, like natural gas (of which helium is actually a byproduct). My understanding is that by forcing the sale of so much helium, Congress has helped to push the price below market levels, encouraging increased sales and wasting. No matter what happens with the helium reserve, the price will almost certainly increase. You might wonder why there could possibly be a shortage of helium since it is the second most common element in the universe. Helium is common throughout the universe, but not here on Earth. Hydrogen and helium have the lightest atoms and the Earth’s gravity is not strong enough to hold them, so there has been a steady leakage of these elements from the Earth’s atmosphere. Hydrogen is very reactive and its atoms combine readily with other atoms to form compounds so most of our hydrogen is still on Earth, in water, rocks, etc. Helium, on the other hand is the most noble of the noble gases. Helium atoms do not combine with any other atoms, so whatever helium was present at the Earth’s creation is mostly long gone. Most of the helium present today is the result of the alpha decay of radioactive elements like uranium, and it appears as a byproduct of natural gas. 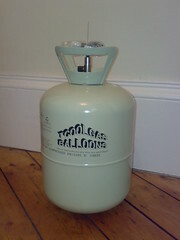 Maybe I should start hoarding helium balloons and canisters. There is no telling how valuable each balloon will be twenty years from now. This entry was posted on August 19, 2013 at 4:46 pm and is filed under Earth, Physics, Science, What's Happening. You can follow any responses to this entry through the RSS 2.0 feed. You can leave a response, or trackback from your own site.